Needle-free drug injection company PharmaJet is close to completing a $5 million fundraising round of financing that would fund the production of 5 million syringes to deliver the polio vaccine. Golden, Colorado-based PharmaJet has a three-year, $10 million contract with the World Health Organization (WHO) to produce a global stockpile of its Tropis intradermal injector, according to company chief financial officer Jeffrey Jordan. The company opened the latest funding round in June 2017, according to an SEC filing, and has raised $4.8 million. 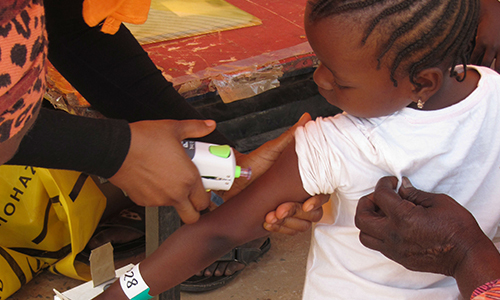 PharmaJet has benefited from global health events, including a movement away from oral polio vaccine, which contains a live, but weakened virus and can actually transmit polio. Meanwhile, greater reliance on an injectable vaccine, which contains inactive poliovirus (IPV), led to a worldwide shortage. Government and nonprofit efforts to reduce needlestick injuries have also benefited the company. The National Institutes of Health estimates the average cost of a needlestick injury at $405, including testing and treatment. Needle disposal and management add to the costs of using needles for vaccination. WHO estimates that 16 billion injections are administered annually worldwide and that up to 40 percent of injections are given with improperly sterilized syringes and needles, which adds millions of dollars to global medical costs and has led to more than a million deaths. While low-income countries generate less hazardous waste per hospital bed per day than high-income countries, healthcare waste is often not separated into hazardous or non-hazardous wastes in low-income countries, making the real quantity of hazardous waste much higher. There is another cost to consider – the amount of vaccine needed to deliver. WHO provided PharmaJet with initial funding to develop its intradermal technology after studies in Cuba, India, and Pakistan demonstrated the efficacy of using intradermal injection of smaller amounts of IPV (0.1 ml) in two doses over the standard, one-time needle-injected 0.5 ml dose. Intradermal delivery can reduce the amount of vaccine needed by as much as 80 percent in some cases, according to the Centers for Disease Control and Prevention. PharmaJet’s other injector, Stratis, is designed for intramuscular/subcutaneous delivery of 0.5 ml of a drug. A 2016 WHO-funded study in Pakistan showed that intradermal administration of IPV using PharmaJet’s Tropis injector by non-professionals “demonstrated that it is feasible, safe and efficient” for use in a vaccination campaign setting. Tropis was faster than needles used with and without intradermal needle adaptors and wasted less vaccine, the study added. Tropis consists of a hand-held injector, needle-free syringe and a filling adaptor, providing a “push and click” delivery. The user pushes the injector against the skin and presses a button to retract the sleeve and administer the injection. PharmaJet intends to produce the first 5 million devices under the WHO contract this year, and an additional 2 million per year in 2019 and 2020, he said. The rest of the current fundraising round will be used for operations. The company has raised more than $50 million since 2005, when Kathleen Callender and her daughter, Heather Callender-Potters, founded the company. A dental hygienist, Kathleen Callender volunteered overseas and noticed how many needles were being discarded in garbage piles, where children were picking them up. Aside from WHO, other customers include British-based influenza vaccine company Seqirus, as well as with the Serum Institute of India, which uses Tropis for its MMR vaccine. PharmaJet has the only commercially available needle-free technology with appropriate regulatory clearances for reaching all target tissues, according to AngelMD. Other key players in the needle-free injector sector include Antares Pharma, Inc., PenJet Corporation, Medical International Technology, Inc., INJEX Pharma AG, Crossject, National Medical Products Inc., Valeritas, Inc., and European Pharma Group, according to a 2017 report by Allied Market Research. WHO estimates the global market for vaccines will reach $100 billion by 2025. On the research front, Pharmajet is working with the National Institutes of Health on injections of nucleic-acid based vaccines, which can be used to tackle the Zika virus. The French company Invectys is testing PharmaJet’s technology for oncology applications, and Vaccibody of Oslo, Norway, is is using it for HPV vaccine injections. “We are very encouraged and really in a nice window where were really about to accelerate our growth,” Jordan said.